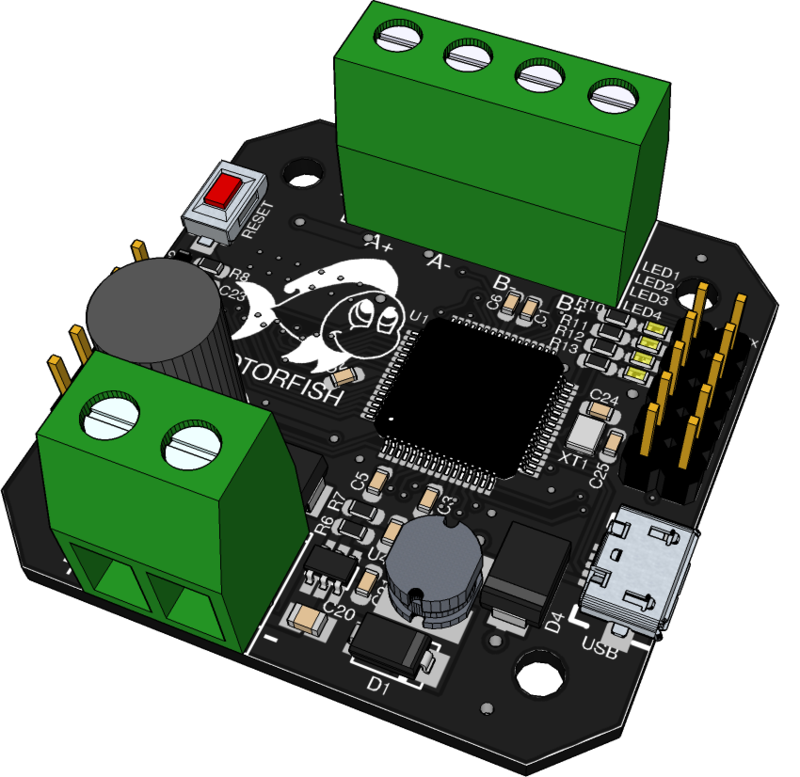 MotorFish is an intelligent driver for one stepmotor or two brushed motors. 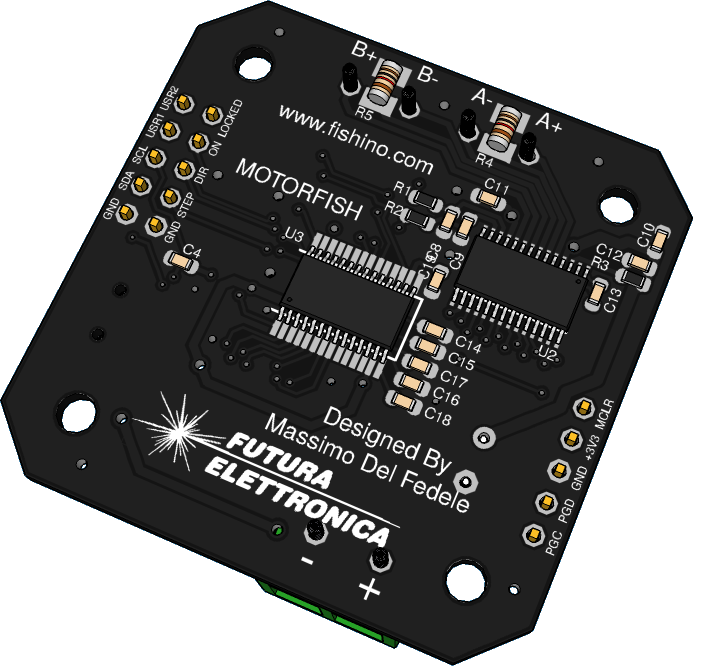 MotorFish is able to drive a bipolar stepper motor or 2 brushed motors with a current up to 2.5 Ampère per phase. MotorFish has a precision magnetic encoder on board, with a 12 bit (4096 steps) angular resolution, which doesn't need any mechanical coupling with the motor; you just need to glue a small radially polarized magnet on the crankshaft on the stepper's backside and fix the board on the motor with 4 screws. An autocalibration routine is able to compensate for any sensor's non-linearity or small positioning errors. Unline standard low-cost drivers, in MotorFish all parameters are configurable via software, comprising the max motor current. MotorFish's driver is able to withstand a 42 volt supply, allowing so a quick motor response even in case of big windings inductances. The board provides a small switching converter able to get the 3.3 Volt needed for on-board electronics directly from motor's voltage; you don't need to provide any additional low-voltage supply. The standard step/dir MotorFish's interface allows direct replacement of old drivers; of course, if the closed-loop behaviour is needed the user's software must be adapted do handle the "locked" signal.. Even without software patching, the driver is able to compensate for step losses, walking up to requested position if possible. MotorFish uses a performant 32 bit MIPS controller to handle all motor's and interface operations. The ability of MotorFish to be completely re-programmed allows to handle any kind of motor control needs ; you can use to drive a stepmotor or to precisely control the speed and direction of 2 brushed motors.